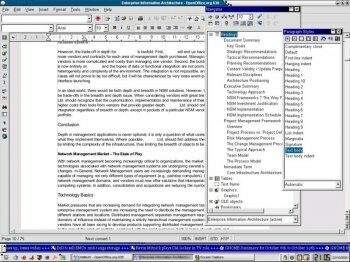 OpenOffice is the open source project through which Sun Microsystems is releasing the technology for the popular StarOffice productivity suite. It is an international office suite that will run on all major platforms and provide access to all functionality and data through open-component based APIs and an XML-based file format. It establishes the necessary facilities to make this open source technology available to the developer community. I would wish for both OpenOffice.org and LibreOffice to get a full sandbox as Gogole Chrome and Adobe Reader have. It is still a very big download at 155 MB, not to mentions it's size after installation. Runs on Mac, Linux, Windows and many other platforms. Betanews should update it's 10 year old OpenOffice screen shot. OpenOffice looks much better than that. 3.0.0 came with Mandrake Linux 2009 and it's looking very good. Man, I am totally glad we have an alternative to Microsoft that isn't some push-over half-arsed job. Open Office 3.x is a very usable, very functional and very productive application suite, and even with its' reliance on Java, I think it is worth looking at, especially if you have trouble with that new RIBBON interface in MS Office. No retraining needed with this suite - apps all feel familiar and it's easy to get up to speed. What Alpha258 said: the UI is smoother in the Linux version, too. Far better than MS Office because it uses the (honestly) ISO certified ODF format. Easily customizable, portable, and can be used accurately across all supported platforms. Oh, and if you use OpenOffice, Redmond will hate you for life. All the more reason! I have never had a problem with Openoffice, it is one of the great apps Linux has and it runs much faster on Linux compared to the Windows version. No longer dual-booting, woohoo! Under the latest Gnome, this still looks great, and runs as smooth as glass. Even on an old machine, OpenOffice is faster on Linux than the Windows version is under Vista on a fast machine. Go figure. 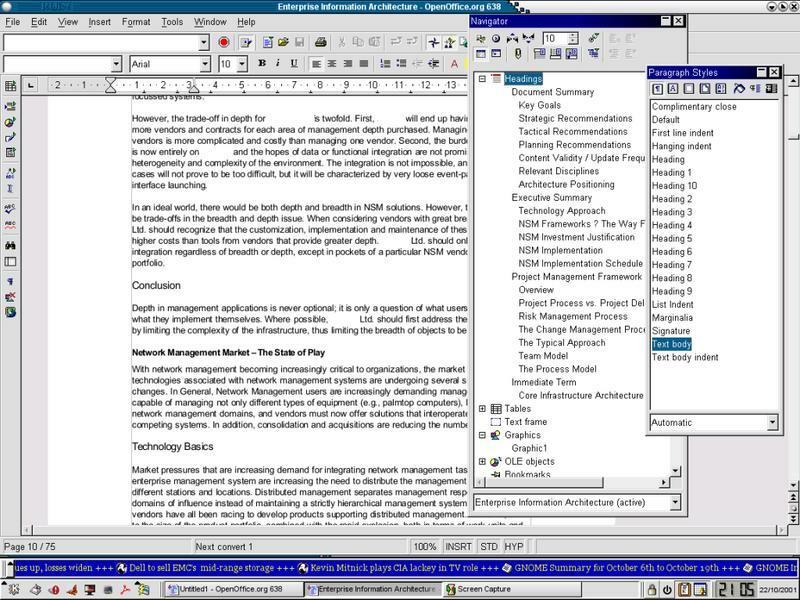 If only the OpenOffice Windows (Vista) interface looked as good as the Linux interface. Since I dual-boot Windows, this lets me go back and forth seamlessly with my files. OMG, a final version? Woohoo! As usual, faster than I expect, and a file format that can never die. robmanic44 -- Koffice??? What a joke this is much better. I wish the KDE developers would ditch Koffice and concentrate more on the desktop. OpenOffice is the best thing that could have happened for OSS and Linux. A lovely bit of software which I install on all of my machines. It removes the need for MS Office in 99% of cases. The only feature I'd like to see at present is smaller update files, rather than having to download the entire installation again each time. The first thing I do when installing a linux distro is remove this and run K-Office. I think that if K-Office is ever released to Windows, it will replace most of the other office suite currently in use. It's that good.